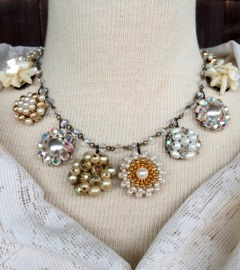 Hand-crafted vintage jewelry designed using authentic, antique items. My signature on this elegant line of altered jewelry is an antique Paris Back button at the clasp. 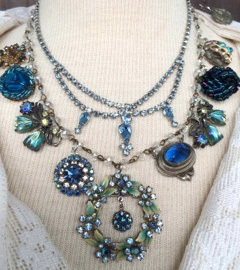 These breathtaking collage and statement necklaces are one-of-a-kind, and are hand-crafted using vintage objects, such as buttons, buckles, and brooches. 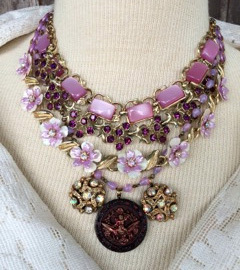 As a long time collector of antique, vintage memorabilia, I love choosing beautifully crafted pieces of the past to create these stunning, over the top statement necklaces. Laura Bergeron: Alternately known as lover of antique buttons, silversmith, collector of gorgeous and sublime bits of victorian jewelry and art deco memorabilia, devotee of Joan of Arc, Special Education teacher, and mother of three perfect (you know what I mean) children. I love combining stunning, old and rare jewelry and decorative pieces into amazing statement necklaces, earrings and bracelets. Antique buttons nearly always have a place in my pieces. No reproduction buttons or typewriter keys have been used. Each piece of jewelry carries the energy of the past to you. Antique buttons, typewriter keys and cufflinks are one of a kind. The items you see pictured here are the items you will receive. Exact duplicates, due to the nature of these antique treasures, cannot be ordered. However, should you desire more of a certain item, please e-mail us and we can hand select or create one or more items made with very similar components. If you are returning to the website looking for an item that does not appear to be offered any more, it has been sold. Another similar item will soon be posted. More answers to FAQs are available on the Help page. The handcrafted jewelry on display here is for sale in my Etsy store. No reproduction buttons have been used. Each piece of custom jewelry is truly unique, and features a signature Paris Back button clasp. 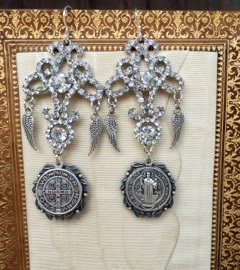 Handmade jewelry designed with authentic antique items (no reproductions!). Featuring my signature Paris Back button clasp. Proudly offering one-of-a-kind wearable works of art.